Hindi cinema at one point had a genre pertaining to films based on dacoits. Some highly memorable films are from this type of cinema like MOTHER INDIA , GUNGA JUMNA , BANDIT QUEEN , JIS DESH MEIN GANGA BEHTI HAI , MERA GAON MERA DESH , CHINA GATE  etc. Then there were films that weren’t completely on dacoits but had popular dacoit characters like SHOLAY , LAJJA  etc. In recent times, there has been only PAAN SINGH TOMAR  which talked about the goons, that too of the dreaded Chambal region. Now Abhishek Chaubey attempts to bring back this cinema with SONCHIRIYA and just like PAAN SINGH TOMAR, he bases it in Chambal. Of course, Abhishek comes from a different cinema mindset and it is known from the start and more so after watching the trailers that SONCHIRIYA is not the usual commercial entertainer. Nevertheless, does SONCHIRIYA manage to make an impact? Or does it fail? Let’s analyse. Abhishek Chaubey and Sudip Sharma’s story is interesting and very-well written. The characters are also fleshed out very well. Sudip Sharma’s screenplay helps in keeping the narrative gripping. However, a few developments ought to be better explained. The dialect already makes things difficult to comprehend. And moreover, a few twists are so sudden and quick that viewers might not get a hang of it. Sudip Sharma’s dialogues are acidic and sharp. Abhishek Chaubey’s direction does justice to the plot and setting. This is a complicated film and on most counts, he manages to succeed. On the flipside, he should have avoided a few slow-motion shots as they didn’t seem appealing. Also, a film of such a budget and scale requires execution that makes the film more mainstream and commercial. SONCHIRIYA however is meant only for a niche audience. From ISHQIYA  to DEDH ISHQIYA  to UDTA PUNJAB  and now SONCHIRIYA, Abhishek has remained consistent and has also become a pro in handling difficult subjects with élan. SONCHIRIYA’s intro scene is of flies feasting on a corpse of a reptile. The close-up shot is quite gory and makes it clear that you need to have a strong stomach to digest the proceedings. Also, the language is quite hard hitting. It takes a few minutes to get acclimatized to the setting, characters and most importantly, the Bundelkhandi dialect. But once that happens, there’s no looking back. The madness that erupts during the marriage scene is quite gripping. Same goes for the fight at the doctor’s residence. The entry of Indumati and Sonchiriya add to the drama and tension. The story takes a sharp turn when Indumati’s hubby lands up at the temple. Post-interval, the film slips a bit. The flashback portion, though very crucial, is too long. Till a point, it seems a bit repetitive as well since audiences have seen similar kind of action and dramatic sequences in the first half. But the way it ends is a shocker. The sequence in Beni Ram’s house also doesn’t come out quite well. It’s with the entry of Phuliya that the interest levels go up again. The finale also has a shocking twist. However, there are too many characters and far too many things are happening in the film. As a result, it might be difficult to comprehend some of the developments. The film also has excessive violence and abuses. The performances in the film are of tall order. Sushant Singh Rajput’s entry scene is such that you might not even notice him, since he’s standing amongst the other gang members and he looks just like them. No attempt to stand out or shine! This itself is quite praiseworthy. Of course later, he gets to shine and proves yet again that he’s one of the finest actors around. He is quite endearing in the scene where he’s showing his magic trick. Bhumi Pednekar has a late entry but once she comes in the narrative, she rocks the show. This is unlike the other rural or semi-rural characters she has essayed and gives a praiseworthy performance. Manoj Bajpayee overpowers everyone in his special appearance. One wishes he had a longer role. Ranvir Shorey too does fine. Watch out for his performance in the pre-climax during his confrontation with Lacchu. In fact, his character graph and the way it progresses is an important arc of the film. Ashutosh Rana’s eyes do a lot of talking and are impressive. Khushiya hardly has any dialogues but she’s a very crucial part. In fact, the film is named after her character. But she does fine. Same goes for Hetal (Little Gujjar girl), who haunts Lakhna and Man Singh. Her expressions are horrifying. Sampa Mandal (Phuliya) is terrific and is a surprise of the film. She plays a role based on the real-life dacoit Phoolan Devi and she does it brilliantly. From the gang members, Ram Diwakar (Natthi), Mukesh Gour (Sheetla), Mahesh Balraj (Bhoora) and Abhimanu Arun (Balak Ram) are first-rate. Other actors who do well are Jaspal Sharma, V K Sharma (preist), Dev Chauhan (Beni Ram), Vijay Kumar Dogra (Dr Bhadoriya), Ashwini Mishra (Gopal) and Kumar (Lalla). Vishal Bhardwaj’s music is obviously not of chartbuster variety. However, none of the songs are memorable but they work well in the context of the film. ‘Baaghi Re’ and ‘Ruan Ruan’ stand out. ‘Sonchiraiya’ is well placed and shot. ‘Naina Na Maar’ and ‘Saanp Khavega’ are forgettable. Naren Chandvarkar and Bendict Taylor’s background score is subtle and impactful. Anuj Rakesh Dhawan’s cinematography is splendid and captures the arid landscape very well. The bird-eye shots are also well captured. Anton Moon and Sunil Rodrigues’s action is real and gory. There’s too much of blood and violence but again, it’s something that is required for a film of this genre. Rita Ghosh’s production design is authentic. Divya and Nidhhi Ghambir’s costumes are straight out of life and that era. Shrikant Desai’s make-up is spot-on. None of the actors look glamorous. Meghna Sen’s editing is simple and unhurried. However, the flashback sequence in the second half is stretched and could have been shorter. 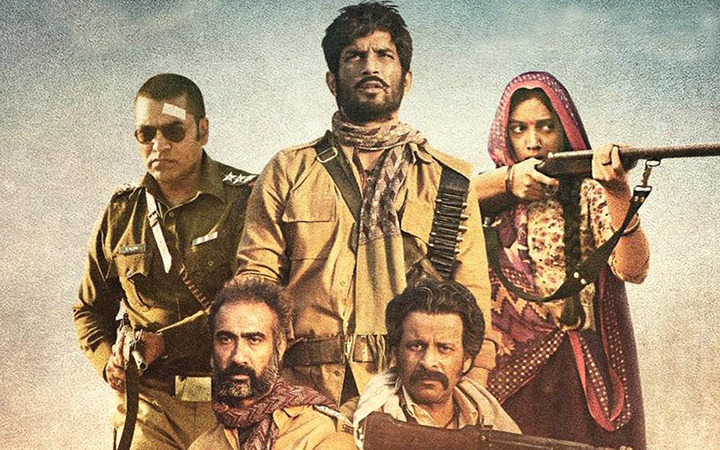 On the whole, SONCHIRIYA is a well-made and a well shot movie with a strong narrative and brilliant performances as its USP. At the box office, its prospects will be restricted as it caters to a different set of a multiplex going audience.